Drake has been wowing his fans at his co-headed ‘Aubrey & the 3 Migos’ tour with hip hop trio Migos, and it’s not just because of his live rendition of In My Feelings. Now in its third month, the tour, which will take place across the US until 18 November, has been a carnival of visual treats, courtesy of live event designer TAIT. Highlights include a light-up basketball court, drones as “backup dancers,” and perhaps most notably, a flying replica of Drake’s Ferrari. According to INSIDER, the “vehicle” is actually an inflatable recreation of the Canadian rapper’s beloved Ferrari. Apparently, there are only 500 of these cars, which come with a rare yellow finish, available in the world. 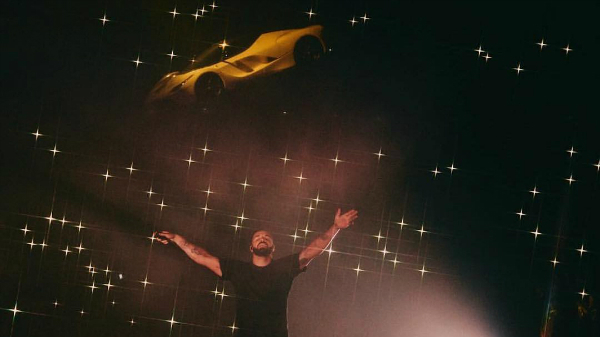 Drake is so proud of his Ferrari, he often features it in his music videos and social media photos. Including the model in his tour would be a natural decision. To incorporate his Ferrari, TAIT commissioned the services of Gear Factor, a company that specializes in making objects “fly” at events. Gear Factor made the inflatable look as if it was driving in mid-air by controlling it with a drone. Most importantly, the ‘Ferrari’ had to survive three months of touring, so transportability was key. It was thus designed “slightly smaller than full-scale but not really in a noticeable way… [to] prevent the piece from being damaged,” described Aaron Seibert, Senior Project Manager at TAIT.